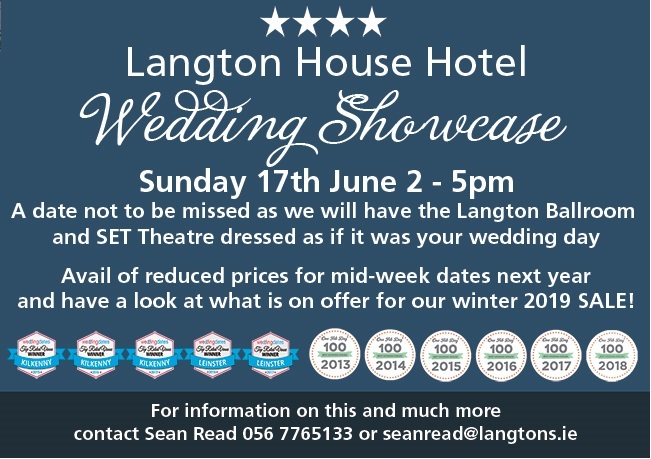 Leading wedding venue, the Langton House Hotel in the heart of medieval and romantic Kilkenny, will hold its Wedding Showcase on Sunday, June 17. So if you're planning your big day, make sure to mark this Showcase in your diary as the Langton Ballroom and SET theatre will be dressed as if it was your very own wedding day. There will be stands and sampling throughout the day, and you should check out the reduced prices for mid week dates and special offers for a winter wedding next year. All you need to know to make your day one you will never forget will be on show in Langton's.